Plan Your Garden: Take time to decide which plants you'd like to grow and how you will design your garden. Consider light levels, soil condition and your expertise and enthusiasm for a realistic plan. Order Seeds and Plants: If you haven't already ordered seeds and plants, February is the time to do so in order to have your plants ready for planting at the appropriate times. Browse catalogues and don't be afraid to try something you've never grown before. Check Winter Sales: Many garden centers and nurseries offer great winter sales in February, cleaning out last year's stock of pots, containers and tools. These can be great deals for any avid gardener. Prepare Your Tools: If you didn't have time last fall, February is a great time to be sure your tools are sharpened, oiled and repaired as needed so they are ready to go into action as soon as spring arrives. Start Slow Seeds: If you plan to add slow-growing plants to your garden, February is the time to start them indoors. Onions, celery, pansies and petunias are just a few seeds that should be started very early for the best results. 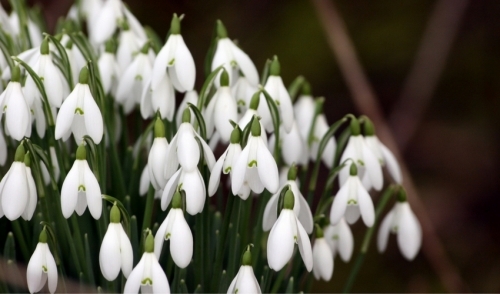 Check for Garden Damage: Winter starts to fade in February, and it's the best time to check your garden for damage from snow, ice or winter wildlife. Correct the damage as needed with emergency pruning, replacing mulch or making plans for spring changes. Prune Trees and Shrubs: Most trees and shrubs that bloom in June or later can safely be pruned in February so they have pleasing shapes and healthy forms for spring. Add the prunings to a brush pile for birds to take advantage of until spring leaves emerge. Keep Up on Compost: There's never a time that you should call it quits with compost, and even in February it's important to turn the compost and adjust its content so it will be healthy and suitable for spring use. Despite being a short month in the midst of winter, February is a great time for certain gardening tasks that can help you be ready to dive into the dirt in spring without any wasted moments.